This is becoming dangerously interesting. No, I don't think that was the reason. I poked around, a couple years ago, and signs seemed to point towards hacking as the activity triggering the sanctions. I believe the reason (and even the sanction) was never publicly disclosed. If you have a good source on this, please cite it. No, I don't think that was the reason. I poked around, a couple years ago, and signs seemed to point towards hacking as the activity triggering the sanctions. I believe the reason (and even the sanction) was never publicly disclosed. If you have a good source on this, please cite it. Source link added to the article. This is... interesting. Many US companies who have done business with the Chinese have come to find their IPs deliberately stolen and their tech replicated by Chinese companies without compensation while having next to no legal recourse. That's not to say that'll happen here, but I wouldn't say it goes without chance. What China really needed was an x86 chip without an NSA backdoor in it. Whether or not cpu's actually have a backdoor is not the issue. China wanted to make sure and the ONLY way was for them to "roll their own". But I wonder if Spectre can exploit it? Likely Meltdown does not. https://www.pcworld.com/article/2908692/us-blocks-intel-from-selling-xeon-chips-to-chinese-supercomputer-projects.html https://www.bbc.com/news/technology-32247532 https://bis.doc.gov/index.php/forms-documents/regulations-docs/federal-register-notices/federal-register-2015/1196-80-fr-8524/file Source link added to the article. Blocking Intel was pointless. The top two Supercomputers are Chinese and they use Chinese designed silicon. From Wiki: "The Sunway TaihuLight uses a total of 40,960 Chinese-designed SW26010 manycore 64-bit RISC processors based on the Sunway architecture. Each processor chip contains 256 processing cores, and an additional four auxiliary cores for system management (also RISC cores, just more fully featured) for a total of 10,649,600 CPU cores across the entire system." What IS interesting is China will be paying royalties!! Now that is a first: China actually paying for intellectual property rather than just stealing it. Blocking Intel was pointless. The top two Supercomputers are Chinese and they use Chinese designed silicon. From Wiki: "The Sunway TaihuLight uses a total of 40,960 Chinese-designed SW26010 manycore 64-bit RISC processors based on the Sunway architecture. Each processor chip contains 256 processing cores, and an additional four auxiliary cores for system management (also RISC cores, just more fully featured) for a total of 10,649,600 CPU cores across the entire system." What IS interesting is China will be paying royalties!! Now that is a first: China actually paying for intellectual property rather than just stealing it. Good point. That one might've backfired a bit. Many point to the US attempts at blocking China as the reason the country plowed ahead so quickly with its own chips for TaihuLight. Backed them into a corner, they came out fighting. The part about paying royalties is interesting and somewhat comical. Well played. That's is surprising that this story leak today. Think about it, Intel must be pissed off. This is huge... and it burst the bubble of many people. 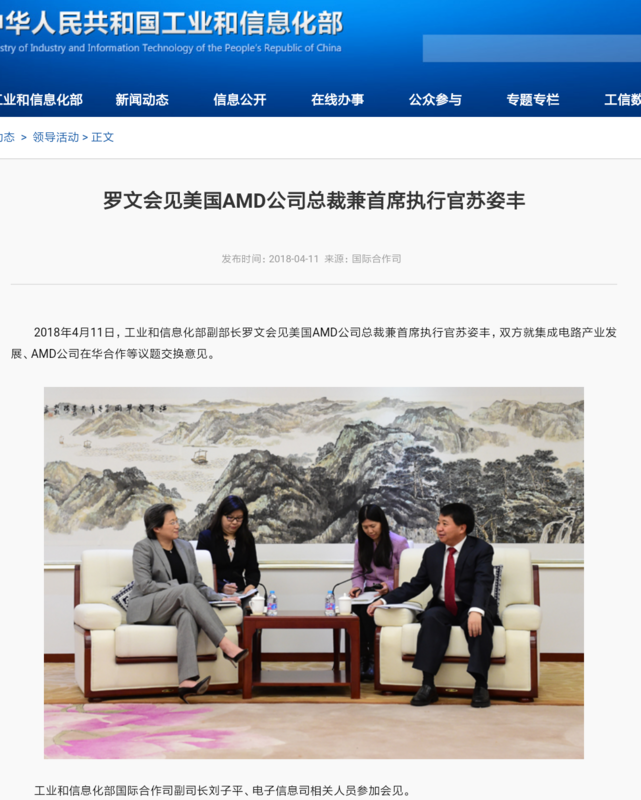 I am glad for AMD, but I am worried about China. Just given me enough info to now root against AMD. I won't be buying an AMD chip anytime soon. China is our greatest strategic rival and AMDs gotten into bed with them. Don't be surprised when it burns to pee AMD! This is bad for China.. China should stay away from X86 and focus on ARM or RISC CPU ... I dont really see a future for X86 in the 20 years to come. ARM will take over soon. Your timeline is backwards and you're only partly correct. The first of those supercomputers (Tianhe-2) went online in 2013 and used Xeons. The sanction apparently happened in early 2015. Then, in 2016, the Sunway TaihuLight went online using Chinese silicon. Now, for that to happen, they obviously had designs for the chips well underway, even if they hadn't originally planned to use them for this machine. That's is surprising that this story leak today. Was any of this newly revealed, or is this just something Paul has been researching, in the background? The partnership was reported when it first happened. That was a major boost for AMD, when it badly needed it to finish off Ryzen and Vega. I don't know what would've happened to AMD without it, but I can't imagine Ryzen would've been quite such a success. As for the Chinese aspect, I actually think it's probably somewhat neutral. Sure, it helps them develop their domestic industry, but I think it actually delays a true, homegrown competitor to Intel & AMD. At least AMD is still in the driver's seat (and financially benefiting), this way. Plus, it starves Intel out of much of the Chinese datacenter/cloud market. So much for all that "being civil" and such. The ad honinems are flying along with a load of other logical fallacies. How disappointing. Yes and no. I think x86 will always be at a disadvantage, due to the complexity of its instruction decoder and certain things like its memory consistency guarantees. But I don't think ARM is exactly headed for the pinnacle of computing performance or efficiency, either. In 20 years, the next dominant conventional (i.e. non-quantum) architecture will simplify the hardware and move some of the complexity into compilers and certain OS-level support services. An extreme version has been tried in the form of VLIW (and slightly less extreme, in the form of Intel's IA64/EPIC). But, I think we're about to see another push in this direction, as x86 and even ARM converge on certain efficiency and performance limits. Oops. You're right. It was. So you will be buying Intel, the company that payed DELL and others in EU, Japan, Korea, not to buy AMD chips, and brought AMD into this mess in the first place. China may be your greatest strategic rival but Intel is the greatest anti-consumer chip company anywhere on the planet. I can't imagine how this can go horribly wrong. Well history has shown China doesn't ground up R&D their own technology. They either buy it from Russia or steal it from the West either through espionage (hacking, insider espionage selling info) or reverse engineering. Just 30 years ago they were nothing but a large populous nation with little globally traded industry. That said, speaking of backing them into a corner, we (the US and allied forces Australia/New Zealand and Great Britain), backed Imperial Japan into a corner starting in the late 1930s by blocking oil, rubber, and other commodity shipments to them. We validated doing so due to their increased aggression in the region and Chinese atrocities*. That didn't turn out so well for the coalition nation forces and we spent the next four years fighting them into submission. * Side note: I find it interesting how China and the US worked together against Japan and we saved a lot of Chinese lives, but then five years later China returned the favor allied with North Korea by fighting against us and killing our troops. I have deep animosity towards China for that alone, let alone a host of other reasons. It seems as though so many, especially US corporations, have forgotten history or just care more about the bottom line sending business there (<-- yes that's it). They are not just a strategic threat to the US in the area. More importantly, they are a growing threat to the entire Pacific Rim area and surrounding Asian nations. They are not shy about provoking Japan militarily and South Korea economically by boycotting their goods (their excuse was the South Korea's military accepting a US defense missile system...something South Korea has every right to have in defense from North Korea)). 10tacle, I agree with your points, but we have to keep in mind the importance of saving face in the Asian civilization(Samuel Huntington, Clash of Civilizations classifies Japan as a separate culture from the rest of Asia, but saving face is huge there too). The thought of "backing down" wasn't possible to Japan(yes, there were a few like Yamamoto, who knew, or last had an idea, of how bad it would get for Japan), and I doubt it will be to China either. They'd rather bleed their people white than back down and lose face. As a conservatarian, I firmly believe companies first responsibility is to profits/shareholders, I don't blame companies for this. I think this is one of those rare instances, where the national security interests of country, have to be asserted by the Government, and they(legislative branch) have to come up with a policy and pass some laws that clearly lay out what is and is not permissible, in regards to IP sharing rights. I detest all governments, but National security is the feds biggest prerogative.